Each month we keep you up-to-date on what you should be seeding, weeding and feeding in your garden. And we’ve made it easier for you! Find all of our recommend products for this month together, in one area in our shop under the This Month In Your Garden banner! If you have trouble finding it, please ask one of our cashiers to locate it for you! For more garden goodness, be sure to subscribe to our weekly newsletter and follow us on Facebook and Instagram! ✔ For all your new plantings, we always recommend applying E.B. Stone Organics Sure Start 4-6-2 for healthy roots and shoots! 1 easy application that gets your plants started off right! ✔ Paydirt and Bumper Crop are now Buy 3 Get 1 Free thru April 30th! What's the difference? 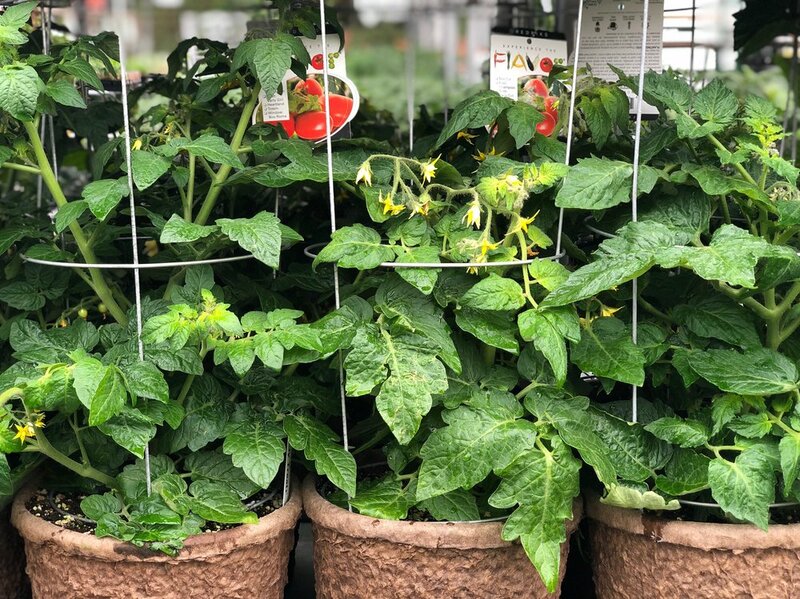 Although both are great amendments adding nutrients and aiding in the structure of your soil, Paydirt, rich in chicken manure, is our choice for veggies and roses. We recommend Bumper Crop, that works well to loosen our clay soils, for all your new plantings of trees, shrubs and annuals. *Amendments cannot be mix and matched. ✔ Bonus Bucks! It's that time of the year again, come in and start earning! Shop during March and April and earn $1 in Bonus Bucks for every $10 you spend. Hold on to these bucks (we recommend keeping them in your glove box!) to redeem them in July, at face value, for up to 50% of your purchase. And best of all - they never expire! Before you plant, check out our favorite Gonzo Gopher Baskets. Easy to use, you won’t regret these when you spot those pesky gophers in your yard - in one foul swoop they can tear apart your most beloved plants, but not with Gonzo! Available in 4”, 1, 5 and 15-gallon keep your plants safe and healthy! Find them near the cashiers in the Garden Shop! Keep the flowers coming with our recommended E.B. Stone Organics Ultra Bloom 0-10-10, and be sure to deadhead! Lilacs are blooming! Plant these beautiful fragrant shrubs in full sun and for more tips, check out Lilacs 101. Don't forget about our Peony selection, they're just leafing out now but will be flowering come May! For our planting tips read Peonies 101. Choose from our huge selection of roses! Be sure to check out our Bareroot 101 for planting tips and remember, at this point we recommend planting the rose and pulp pot into the ground directly as to not disturb their root growth! Fill in with instant color from our Bedding Department! Plant annual flowers such marigolds, alyssum, violas and impatiens to name a few. They will give color all spring long! Find our hardy shrubs and trees displayed throughout the nursery including magnolias, dogwoods, lilacs and soon to be flowering snowflake viburnums. Spread seeds of flowers for beautiful blooms! Easy to do, shop our selection of nasturtiums, sunflowers, zinnias, alyssum, lobelia, cosmos and more! For all your edible plantings, don’t forget to pick up a bag of E.B. Stone Organics Tomato & Vegetable Food 4-5-3 - feed your veggies and they’ll feed you! Tomatoes are here! We’re expecting roughly 200 different varieties over the season with new arrivals coming in weekly! Peppers, beans, are due to arrive the first week of April - lookout! Summer herbs are arriving with Basil due to arrive when it warms up a bit more (think mid-April!) Check out our Herb List for more info on each herb including growing habits and pairings! Start seeds of carrots, beets, swiss chard, lettuce, and radishes this month! Visit our shop for our E.B. Stone Organics Seed Starter Mix and potting containers including cell trays and peat pots. Select and plant fruit trees including citrus! Our Bareroot 101 will give you tips and tricks for planting. Plant delectable strawberries, raspberries, blackberries and blueberries. Paydirt - BUY 3 GET 1 FREE! Your plants are starting to grow, time to apply a general fertilizer for all your plants! We recommend using either Master Nursery's Multi-Purpose Fertilizer 16-16-16 or E.B. Stone Organics All Purpose Plant Food 5-5-5. Time to feed your citrus! We recommend using Master Nursery's Citrus Food 12-8-4. If you're noticing any yellow leaves, add Iron Plus! Remove spent blooms from camellias and azaleas once flowering is over and serve them up with Master Nursery's Camellia, Azalea, Gardenia & Rhododendron Food 4-8-5 and F.S.T. Iron & Sulfur. It's the month to feed all acid-lovers including blueberries! Catch the Queen! Set your traps out now and spare the headache of those buzzing pests! Our shop is stocked with different choices on traps, perfect if you need a refill, a new trap or something disposable for picnics and camping trips! It's time to set your codling moth traps to insure your apple, pear and quince harvest is healthy and bountiful! We recommend using Oak Stump Codling Moth Trap as an 'alarm system' to determine whether or not you will need to spray later in the season. Male moths are baited and captured with a pheromone, reducing mating but more importantly, indicating your level of moth activity. For a small tree use one to two, for larger trees, use two to four traps, checking every two weeks and replacing them when needed. Beginning two to three weeks after the first adults are caught, roughly two to four weeks after bloom, you will begin to spray. The first spring generation will require two to three sprays, 10 to 14 days apart. No more than six sprays should be applied per season. Captain Jack’s Organic Deadbug Brew is one of the few effective insecticides available for codling moth. We’re a big fan of Captain Jack's Organic Deadbug Brew for its effectiveness on pests including thrips, aphids, caterpillars, leaf miner, spider mites and more. Use it to treat your pest problems this month. Did we mention it is safe around children and pets, too? Time to take care of the weeds, they're growing just as fast as everything else in your garden! Apply High-Yield Weed Killer 15-0-10 or Fertilome Weed-Out RTU to control and prevent pesky weeds in your garden. Spray Fertilome Copper Fungicide on peaches and nectarines to prevent peach leaf curl. Then from bud break to petal drop (about a month long), spray Copper Fungicide once a week, for a total of four sprays. After all the rains we had, slugs and snails will be out en masse. We recommend using Monterey’s Sluggo or Sluggo Plus to protect young tender growth of flowers and vegetables. Celebrate with our favorite springtime decor including bunnies, chicks, eggs and more! Find them both in the Garden Shop and at The Lazy K! Have a question specific to your garden? Come visit us at the nursery and speak with one of our certified nursery professionals!